Reuters: Hillary Clinton supporters are pretty racist, too. 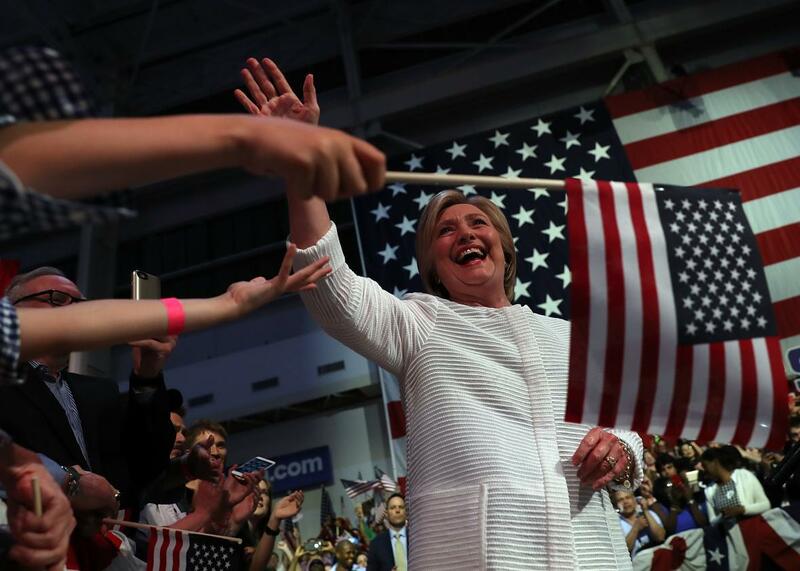 Hillary Clinton greets supporters during a primary night event on June 7 in Brooklyn. A new Reuters/Ipsos poll paints a particularly depressing picture of the U.S. electorate’s opinions on race. The main takeaways from the survey, which was released late Tuesday: A significant slice of Americans expressed racist views against blacks, and those who identify as Donald Trump supporters are more likely to fall into that group, though Hillary Clinton supporters are definitely there too. Roughly one-third of Trump supporters described blacks as less “intelligent” than whites, compared with about one-fifth of Clinton supporters who did the same. Among all respondents, 22.5 percent suggested whites were smarter than blacks. 40 percent of Trump supporters described blacks as more “lazy” than whites, compared with one-quarter of Clinton supporters who did the same. Among all respondents, 26.8 percent suggested whites were harder working than blacks. 44 percent of Trump supporters described blacks as more “rude” than whites, compared with 30 percent of Clinton supporters who did the same. Among all respondents, 31.3 percent said whites were more well mannered than blacks. Nearly half of all Trump supporters described blacks as more “violent” than whites, compared with nearly one-third of Clinton supporters who did the same. Among all respondents, 32.8 percent said whites were less violent than blacks. Nearly half of all Trump supporters described blacks as more “criminal” than whites, compared with nearly one-third of Clinton supporters who did the same. Among all respondents, 33.2 percent said whites were more lawful than blacks. Still, it’s worth taking a long hard look at the non-Trump results, too. Racism—that is, the belief that one race is superior to another, which is exactly the view being expressed in these numbers—is not hard to find among those backing the presumptive GOP nominee. But this survey makes clear that it’s also not all that much harder to find it among the general population, including those who want to see Clinton in the White House: all you have to do is ask.